Make sure you’ve rated all the tiki bars you’ve visited. You don’t have to have restrict yourself to places you’ve visited this year: Critiki is all about the places that have proven themselves over time. Be sure to revisit any of your previous ratings, and update them if your more recent experiences have changed your opinions. Visit “Your Ratings” to see all of your ratings in one place—you can click the “Your last update” heading to sort by oldest first, to see which ones may most be in need of a tweak. Don’t just focus on the best and brightest. While you’re at it, please take the time to share your thoughts on the not-the-best-but-still-interesting, or the oof-don’t-waste-your-time spots. All of it helps your fellow tikiphiles know what to expect when they go traveling! Want your chance to weigh in? It’s not hard to become a Critiki member, you just have to sign up and start rating the places you’ve been. Once you’ve signed up, this tour of a Critiki location page has instructions for rating locations. Ready? Head over to Critiki and get started! 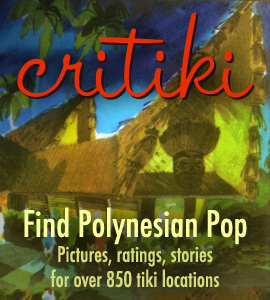 Look for the announcement of Critiki’s Ten Best Tiki Bars in the World for 2016 in late September. Would you add Tahai Twisted Tiki in St. Louis, MO to your site? We finally have a tiki bar again! It’s on my to-do list, thank you for the reminder!